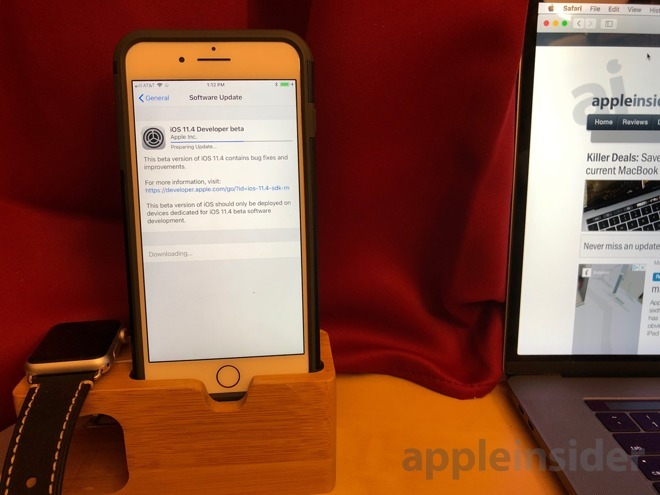 The first iOS 11.4 beta is available to download through the Apple Developer Center, as well as via an over-the-air update for devices enrolled into the beta program. A publicly-accessible version of the beta is usually made available a few days after the developer version is released, which could arrive as soon as Tuesday. Few details about what the beta will include are known, though during last week's "Field Trip" event, it was noted that ClassKit, Apple's framework for allowing developers to link their apps to the upcoming Schoolwork app, will be available in iOS 11.4. Based on this, it is likely ClassKit will make an appearance in the beta releases. AirPlay 2 may also make a reappearance, after failing to be included in iOS 11.3's release. The updated AirPlay communications protocol surfaced in early iOS 11.3 betas but was removed by the third developer beta release, and hasn't been seen since. For iOS 11.3, Apple unusually pre-announced features it would be introducing with the update just before issuing the first beta. At the time of publication, no such pre-release announcement has been made for iOS 11.4. The first iOS 11.4 beta has the build number 15F5037c. The initial beta for tvOS 11.4 follows the same release timeline as the iOS beta, following a few days after the full public release. The first beta bears the build number 15L5536c. Apple's first developer beta for watchOS 4.3.1 suggests it will be less of a major update compared to the others, due to the lower version number increase from version 4.3. The build number for this beta is 15T5535b. As with iOS, there are no real indications for what to expect by installing the betas, with the release notes for all three providing few clues to their contents, aside from a brief list of known issues and a list of developer support resources.